Alumina bifolding door review. What is Alumina? The benefits of foils on an aluminium bifold. Alumina bifolds match with PVCu windows. Cost savings when you buy Alumina. Products matched with an Alumina Bifold. Comparing Alumina with Origin and Visofold. Hardware and Security features of Alumina bifolding doors. How good is the Alumina bifolding door? Reasons to consider Alumina bifolding doors. In this first Alumina bifolding door review, we take a look at the features, options and benefits of Liniar’s latest bifolding door in aluminium. We also tell you what other brands Alumina can be considered against as well as focusing on its features you will not find on other aluminium bifolds or door and window systems on the market. Liniar, one of the best known PVCu systems companies in the UK is behind the Alumina bifolding door. When we first saw the product, we liked its different aesthetics and the overall new concept. Here is what we can tell you about Alumina bi folding doors and whether you should consider buying them. The Alumina bifold is an all aluminium bifolding door with a polyamide thermal break. It has all the strength, quality and craftsmanship associated with a well-designed aluminium bifolding door. Alumina folding doors have the pedigree that is behind Liniar’s broader range of PVCu windows, doors and home improvement products. With Alumina, Liniar sought to shift from the similarities found in many aluminium bifolds. The first shift from traditional aluminium bifolds is the sculptured line of the product. The second is the warm-to-the-touch exterior. This is thanks to another new feature by Alumina – a foiled aluminium bifolding door. Door aesthetics are subjective, however, the Alumina is a very good looking bifold. There are other features and options that we cover in this Alumina bifolding door review. The core frame components with Alumina comprise ABF091 Outer Frame and ABF092 door sash. These are the only two major frames available, both with a sculptured detail. The six glazing beads available are square, sculptured, chamfered to suit both 28mm double glazed units, 36mm and 40mm triple glazed units. Added to these are a cill and several threshold options. The profiles enable single doors, French doors and two to seven panel folding doors. As you would expect, doors open in or out, slide in one or two directions and feature a traffic door. A trickle vent through the sash (although this will need them to every sash to avoid a clash when the doors fold). A 30mm frame extension at the head. An optional Head Vent section. Alumina comes with five different threshold options. These include a weather rated low threshold – something few bifolds provide. It also meets disability requirements (Equality Act, BS8300 and Part M of the Building Regulations). The low threshold option provides a great solution for homeowners especially. Other major brands stipulate no weather performance or internal use only. You can use a low threshold Alumina bifold inside or as an external bifold door. Alumina doors come in sash sizes of 1200mm wide and 2500mm high. The maximum width is 6 metres overall. For those wanting small doors for roof terraces, commercial shopfronts and other uses, the smallest height is 1850mm with the smallest door leaf being 700mm. Powder coating remains the most common method of colouring aluminium, but foils have other advantages. The foiling of PVCu windows creates some stunning finishes. Foils also feature on some of the most expensive and luxurious PVCu windows and timber-look products. The advantages are a better appearance a longer life on the surface. Foiling aluminium creates a warm-feel bifold’. A foiled aluminium bifold feels different to the touch. Foiled aluminium enables a woodgrain finish. Foiled aluminium bifolds like Alumina are not subject to very long lead times. You can even have plain colour foils with aluminium, just like PVCu . Foiled versions of Alumina are supplied with a matching PVCu bead – making them easier to install and further enhancing thermal efficiency. Therefore, with a product like Alumina that is the only foiled aluminium bifolding door on the market colour choice as well as texture is available, not to mention a very appealing wood effect bifolding door. If a homeowner desires wood effect outside and a plain colour inside, the lead times with other aluminium systems are very excessive. The few systems companies supplying bar length profile to their manufacturers can quote up to six weeks or more just to deliver the material. This can push a delivery date for other aluminium bifolds up to 10 weeks or more. So a foiled Alumina does offer an advantage to those customers wanting a dual colour bifold without the wait. Finally, you should get a bigger choice of woodgrain with a foiled product than a sublimated versions. If you have not seen a foiled aluminium bifolding door before, it is worth checking out. Contact us and we can put you in touch with some showrooms where you can view Alumina bifold doors. Despite the popularity of aluminium compared to five or even ten years ago, PVCu remains the dominant replacement window in the UK. For value, energy efficiency, ease of installation and simplicity, PVCu is best for many. 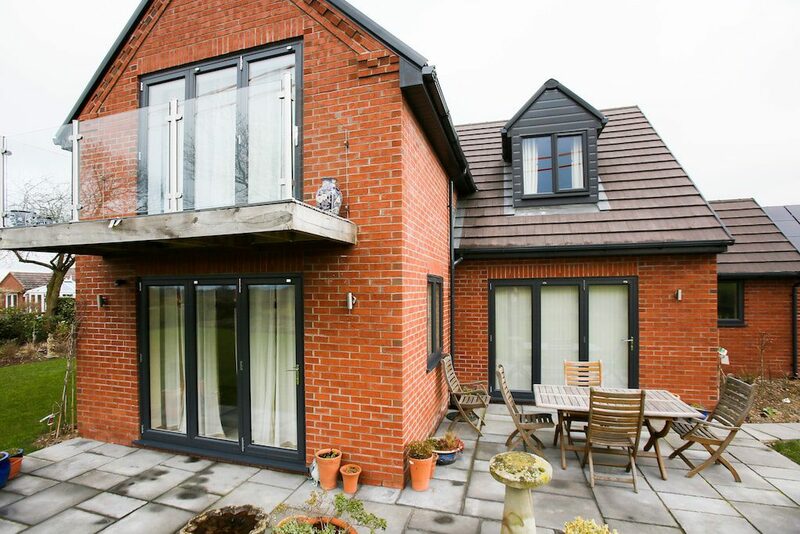 Homeowners who replaced their old windows with new PVCu in recent years are perfectly happy with their purchase, expecting their new windows to last a long time – as indeed they should. 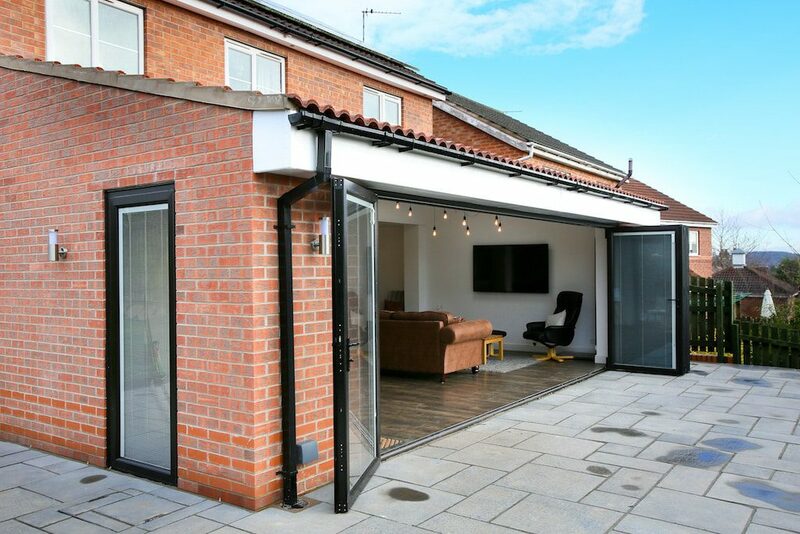 Following the installation of new pvcu windows, it is also likely that a homeowner may consider the building a new extension to incorporate bifolding doors, or to replace their old sliding doors with a new bifold. There are some homeowners who love their new aluminium bifold so much they want to replace their PVCu windows with aluminium. The reality is the cost can often be prohibitive. Alumina does the reverse in matching a new door to their existing PVCu windows. Alumina is different again in that while it is entirely fit for purpose as a stand-alone bifold, it is also a great product for matching the sculptured appearance of Liniar and colour of other PVCu windows. It is also a great addition to the many thousands of homeowners that have Liniar PVCu windows in their homes. The exact same colour process throughout the home. The same sculptured appearance to match PVCu windows. There are even matching colour silicones and window trims. Because Alumina matches Liniar PVCu windows, there are cost savings to be had when working out budgets. It is usual to have new aluminium windows to match bifolding doors. The main reason is colour matching and a similar visual appearance. What Alumina offers is the facility to save money by having Liniar PVCu windows, cheaper than any aluminium window. As a result, you save money by having PVCu yet still having the same colour thanks to foils and a matching appearance. Single doors and French doors. It makes sense in this Alumina bifolding door review to compare the door with two other bifold door brands. We chose Origin and Smart Systems’ Visofold 1000. There are other doors to compare Alumina with such as AluK, Schuco or Reynaers. We chose Origin and Smarts Visofold because these also come in a wood effect finish, although not foiled. Sunflex bifolding doors also come in woodgrain but are more expensive than these brands. For foiled bifolding doors, Liniar foil all their own extrusions, where many use external suppliers. Alumina offers better thermal efficiency than many of the other bifolds on the market when glazed with standard specification thermally efficient units. Typically these achieve 1.6-1.8Wm2K. 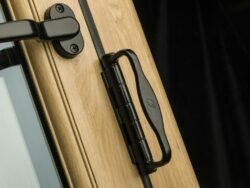 Alumina offers discreet hinges, great security features and even folding keys to prevent damage to the frame when doors are opened with the key still in the lock. Study the hinges of the Alumina bifold carefully and you will notice the intermediate door handles are integrated with the hinges. This gives an uncluttered look to the door and a neater appearance. Another great feature of Alumina is the facility to fit a door restrictor. This gives an element of door control to the independent traffic door. The restrictor works with French doors within a four or six panel bifold too, holding the door open at 90 degrees. Alumina comes with the choice of white, black gold and chrome rollers, the latter looking very eye-catching with matching hinges and handles. Handle colours are the same as the roller colours but also include a dark chrome option. With Alumina the locking hardware is what you would expect from a highly-engineered product. You get bi-directional locking points, shoot bolts that engage into the head and track and anti-lift feature. There are anti-bump cylinders available as well as optional anti-snap as well. The locking system from Alumina has won a Queens Award for Enterprise in 2017. Called ModLok™, this patented locking system provides both a lock and a thermal insert. ModLok™ has a high strength polymer lock body, meaning the lock is also a thermal break. No other aluminium bifold features this locking system. We must also mention that Alumina is tested to the stringent PAS24 and carries Secured by Design (SBD) accreditation as well. You have to be very careful with claims over SBD and whether the license for the product exists as a number of doors don’t have the accreditation or hold the license. Alumina bifolds are also Part Q of the Building Regulations Compliant. Finally, for the door cylinders, Alumina doors come with the option of standard or folding keys. You also get the choice of keyed alike cylinders. This is useful where you have more than one bifold on a project and want the same key to unlock any of them. Finally, you can order extra folding key blanks to cut extra keys. All cylinders are anti-bump. The great thing about the current and mature bifolding door market, the calibre of aluminium designers and the broad range of product standards and certification is that there is no ‘bad’ bifolding door on the market. As long as a fabricator makes any bifolding door as the systems company intends and it is correctly installed by a competent installer, they’re good products. This makes the job of reviewing a product harder when all products today are secure, safe, weather resistant and reliable. So what we do is look at the features that made a door stand out. But where bifolding doors will differ is in their engineering, their components, the range of colours and specifications. Homeowners doing their research around bifolding doors will see many repetitive messages around security, U-Values, weather performance and quality. This is true of many quality bifolds and Alumina is no different. It is secure, weather resistant, well designed and comes from a company with immense knowledge in the design of windows and doors. In this Alumina bifolding door review, we see similar specifications against other leading brands of aluminium folding doors there is no reason not to consider this door with them. In fact, Alumina offers some features the others do not. With seven stocked foil colours for both sides of the door, six colours for the outside face only on dual colour, colour options are certainly a great feature of Alumina bifolds. Liniar also foils their own profiles as well. The door restrictor and folding keys a great idea. We hope our Alumina bifolding door review explains more about this new aluminium bifolding door. Some systems such as Schuco bifolds, Reynaers or Sunflex are designed to be flat in appearance. The best selling bifolds such as Smart Systems Visofold, AluK and Origin are softer in aesthetic. Ultimately it is the customer that chooses the door they like. There is no reason not to consider Alumina alongside these other brands. Alumina does go further with more handle options, more door configurations, more hinges and roller options than other systems. What you also get with an Alumina bifold are more threshold options and a weather rated low threshold too. Finally, with the option of foils, you get a greater choice of colour and texture than other doors on the market offering just RAL colours. If you’ve not seen the foiled finish, it is worth looking at. Alumina will appeal to those homeowners happy to choose a quality Liniar PVCu window but understand the benefits of an aluminium bifold. Visually Alumina is very different, as well as being everything you expect from a quality, engineered aluminium bifold with a bit more thrown in. This review from 2017 is updated to reflect improvements in the product. Additionally, Alumina bifolding doors are available to installers from Liniar on 10 day lead times for standard colours and foils. Contact us for further information and where to buy Alumina bifolding doors.